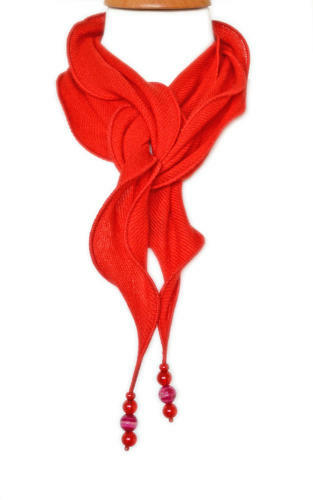 It is a light weight accessory which can be worn around the neck to give an elegant look for the day or evening. It can be wrapped around the neck or left long depending on the look. Worn instead of a necklace it is a functional and decorative accessory. Add a splash of colour to a plain top with a smart and elegant wool/silk Necklace Scarf. Neatly edged and a detailed zigzag stitch in the centre, it is finished off with coordinating beads on each end. Wash Care Instructions: Hand wash in cold water or professionally dry clean. Please note: As each scarf is individually handmade the placement of the pattern on the fabric, the beads and colour of beads will vary with each piece.